I wasn’t sure what more I could write to follow up on my article concerning the second gravitational wave discovery claim by the LIGO team that I posted exactly one year ago today. Instead of hundreds or even dozens of subsequent detections that were predicted to be made since that time, there has been only one! This third detection, GW170104, occurred over a year after the second one and is the weakest and least precise of the three. It involved intensive pattern matching techniques just like the first two discovery claims. It also cannot be exactly duplicated using LIGO’s own provided data and procedures, just like the other supposed discoveries. And just like the other two claims, these involve binary black holes, not neutron stars which is what LIGO was originally designed to detect. And just like the other two, the distance to these objects is far beyond the detection range originally claimed for LIGO. In fact this latest event is the furthest yet at almost 15 times the maximum detection range originally claimed. So I didn’t really feel like repeating myself and had not planned to write anything new for this latest pseudoscience announcement. But then something unexpected happened. Less than two weeks after the LIGO team published a paper about their third detection a group of Danish scientists published a paper questioning the data analysis techniques used in all three of the LIGO team’s gravitational wave discovery claims. While they focused mainly on the first event, GW150914, the premise of their paper is simple: if the detected signals are truly astrophysical events there should be practically no correlation between the “residual” background noise recorded by LIGO’s two detectors, detectors that are separated by thousands of kilometers. But they not only found a very strong correlation between the noise, but discovered it was time shifted by the same amount as the supposed detected signals! If the signal and background noise are both shifted and correlated how can one really be distinguished from the other? A member of the LIGO collaboration, Ian Harry, quickly posted a response to the Danish group’s paper. A short time later a member of the Danish group, James Creswell, posted his own response to Harry’s response. 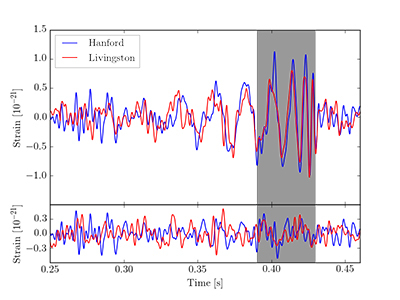 In Creswell’s post he provides additional information and examples, further backing his group’s findings questioning the accuracy of LIGO’s data analysis methods. Ultimately both researchers agreed to work with one another to help better understand each other’s analyses. But this exchange has received very little attention in the media and only one scientific group has formally questioned LIGO so far. Unless more groups begin questioning each and every LIGO detection claim and more media outlets begin reporting it, critical analyses like the Danish team’s will most likely end up ignored by LIGO, the scientific community and the general public. One comment on "Third time is not the charm for LIGO gravitational wave ..."